300kW at all fours - without using the nitrous! 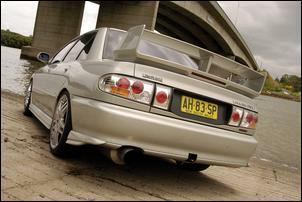 When Australia received the 1.8-litre Lancer GSR AWD turbo in the early ‘90s it was right up there with the popular Subaru Impreza WRX in terms of bang for buck. 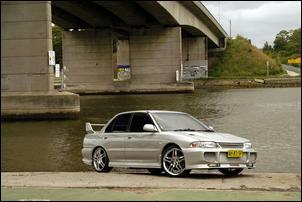 But we missed out on the ultimate Lancer package that was being enjoyed in Japan – the Lancer Evolution. Owned by Todd Compton (a qualified mechanic and former workshop proprietor), this Lancer GSR was purchased in 1997 with just 14km on the odometer. 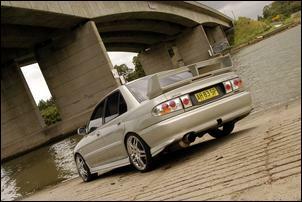 Apparently, 14km was all it took for the original owner to decide the GSR wasn’t his cup of tea – go figure! Anyway, Todd was keen to get a piece of Lancer action so he snapped it up and before long, it was undergoing a transformation to Evo spec. Todd managed to track down a crashed Evo 2 and went about transplanting the whole lot into the local Lancer body – everything from the seats and gearbox to the king-hitting 2-litre 4G63 turbo engine. With the benefit of a 3 inch mandrel bent exhaust, Haltech engine management and 17 psi boost (from the relatively large TD05 16G turbocharger) the Lancer could sprint down the quarter mile straight in just 12.8 seconds. What followed was a barrage of further modifications that eventuated with Todd knocking on the door of Sydney’s Croydon Racing Developments (CRD). At this point, the engine was in need of a rebuild and CRD oversaw the project. Internally, the 4G63 now runs Eagle H-beam rods, CP Racing pistons (with a standard-ish compression ratio), a full balance and the switch to stud fasteners to ensure durability. The DOHC head has been ported and polished and carries bigger valves, HKS valve springs, HKS Group A cams (delivering 272 degrees duration) and HKS adjustable sprockets. You’ll struggle to find an Australian built 4G63 that’s as serious as this. The power push comes from a custom GT35/40 ball-bearing turbocharger which is mounted on a custom tubular exhaust manifold. A 45mm external wastegate ensures boost pressure doesn’t run riot. The turbo compressor inhales through a HKS pod filter and blows into a Mood Motorsport custom front-mount intercooler that’s as big as can fit. 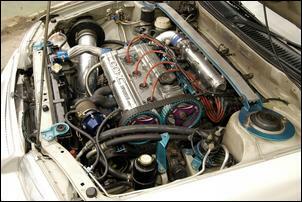 Mandrel bent plumbing routes induction air through the engine bay and a HKS blow-off valve is incorporated. Haltech programmable management controls a set of 850cc Sard injectors which are fed by an arrangement comprising a standard Evo in-tank pump, Mood Motorsport surge tank and Bosch 044 high-flow main pump. The direct-fire ignition is also controlled by the Haltech unit. 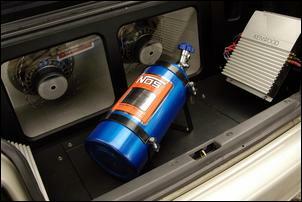 Open the boot and you’ll find a large nitrous tank – and it’s no fake! 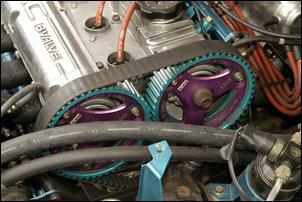 Giggle gas is delivered by a fogger nozzle which is mounted just upstream of the throttle body. A 75hp jet is being used – this is triggered by an in-cabin switch and throttle position. About now you might be wondering whether Todd is on a first name basis with his local gearbox specialist. Not so. To date, Todd has avoided damaging the Evo five-speed ‘box despite fitment of a twin-plate competition clutch teamed with a billet flywheel. Axles and diffs remain stock. With 300kW at the wheels to kick along this little lightweight sedan, there’s an obvious need for some serious brakes. The car now runs massive 350mm front drilled and slotted discs with Holden Commodore Group A calipers while the rear uses standard size drilled and slotted discs. Handling is aided by Pedders 2 ½ inch lowered springs teamed with KYB dampers. 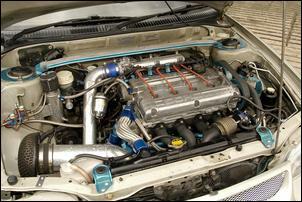 An aluminium front strut bar keeps the front-end rigid. Todd’s Lancer wears traditional Mitsubishi rally battle clothes – the Evo 3 body kit. The E3 kit gives the normally pedestrian looking Lancer a big dose of testosterone thanks to its high-rise wing, aggressive front bumper (with huge cooling apertures) and side skirts. Todd has also added clear lens taillights and a set of Momo 18 inch alloys wearing Falken tyres. 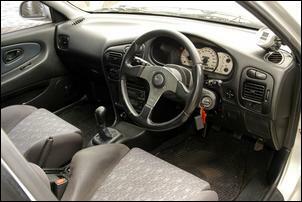 Inside, you’ll find the original Evo 2 seats from the Japanese donor vehicle, a Momo steering wheel, white face gauges and a pretty serious sound system. The boot is professionally trimmed and contains a pair of 12 inch subs while the cabin is filled with beats from rear fill speakers, 5 inch front door speakers and splits in the front kick panels. It’s all headed by a CD stacker unit, EQ and a pair of high output amps. Kenwood is the brand of choice. Having owned the car for around ten years and spent more than AUD$100,000 (yes, that’s right! ), Todd has recognised there’s not more that can be done to the machine. It’s time to move on. If you like the idea of owning a kick-arse fast car with one of the most highly tuned 4G63s in the land, well, you’re in luck. Todd is prepared to hand you the keys in exchange for just AUD$32,000 – you can’t even buy a stock Evo 6.5 for that.